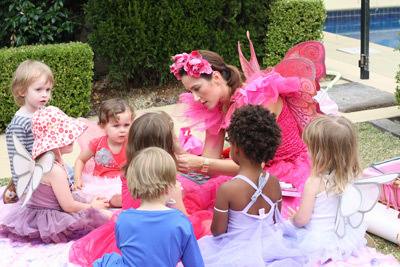 Does it get any better for a 3-year-old girl than a pink fairy princess arriving at your birthday party?!? 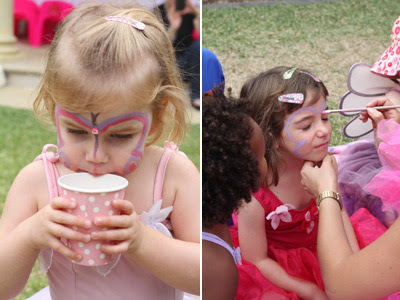 Even the boys loved the pretty fairy and lined up for face painting. The theme was continued throughout the event with Mum Renay creating a magnificent pink castle cake. Lots of fabulous ideas here; thank you Renay for sharing your tips and tricks. All photography taken by Steph Bond Hutkin (that's me!). 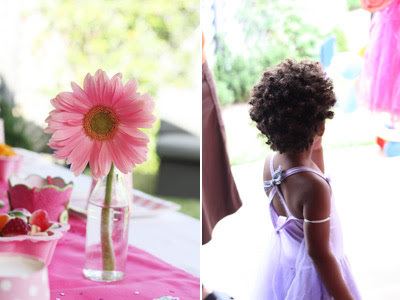 Theme: Fairy Princess - the birthday girl was going through that typical 3-year-old phase of just loving all things fairies and princesses. 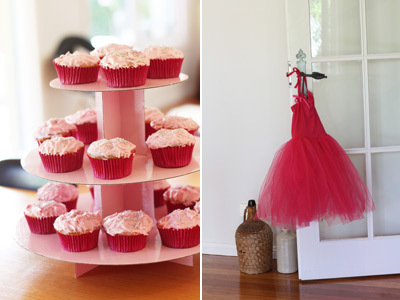 Everything is more fun when you are wearing your favourite tutu and tiara. Invitations: Sourced from my lovely "friends" at mooo. They have saved my life over the years - I have used them for all of my birthday, christening and baby shower invites. 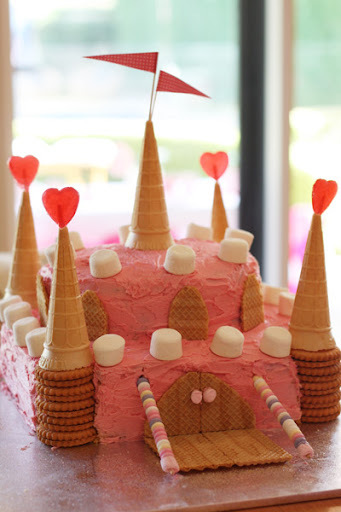 Cake: Fairy Princess Castle Cake hand-picked by the birthday girl from the trusted Kids Birthday Cakes (Australian Women's Weekly Essential). It was actually simple to make and trust me I am no star in this department! I totally underestimated the cooking and cooling time of such a big cake and found myself icing and decorating until 1.30am (the day of the party). Had a ball making it though! The best thing of all was my daughter's reaction and her sheer delight when she saw the cake for the first time. The shock on her face was priceless and made all worthwhile when she looked at me and said with excitement, "Mummy it is exactly the same as the one in the book!" I don't think she really understood until that moment that it was really possible to have a cake that looked just like the one in the picture. Decorations: Ok, so I went a little overboard! I was having a 'mother's guilt' moment when I planned the decorations for this party. The year before when my daughter turned two I had a two month old baby so I was a bit distracted on her second birthday. I wanted to make her third birthday all about her. 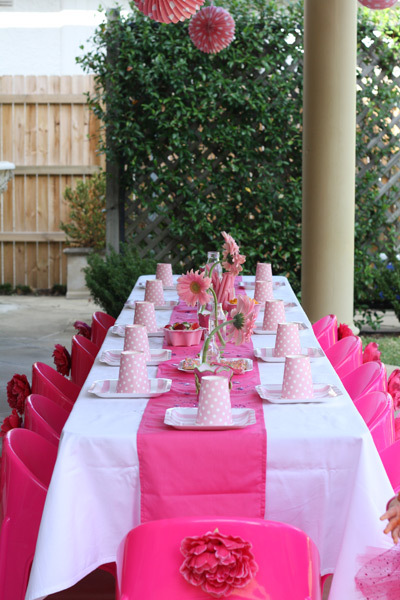 The table, chairs, table cloth/runner and chair decorations were all from Munchkin Tables. They were super-friendly and easy to deal with and best of all they drop off and pick up your order. As an added bonus it was the 'We Recommend' page on the Munchkin Tables website that led me to Fairy Crystal - the amazing organisation that we hired our fairy entertainer from. The napkins, plates and cups (Sambellina) were from The Party Parlour. I love this website - everything you need to make your party special and unique and all delivered to your door. 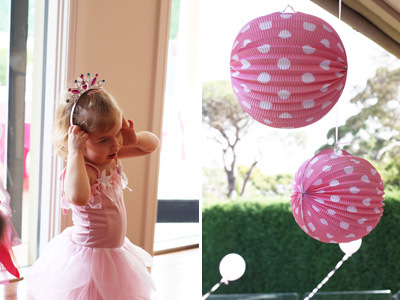 The paper lanterns were from Queen Bee Party Shop, Rozelle, NSW. 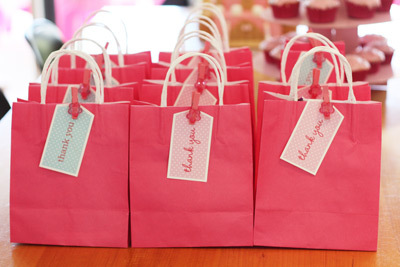 Goodie Bags: The goodie bages were purchased from The Party Parlour who also have amazing little toys/trinkets that you can purchase to put inside the bags. Again all delivered to your front door. We put a tag on the front of each bag (sourced from Queen Bee Party Shop) with each child's name on it, attached with a small wooden peg (from kikki.K). 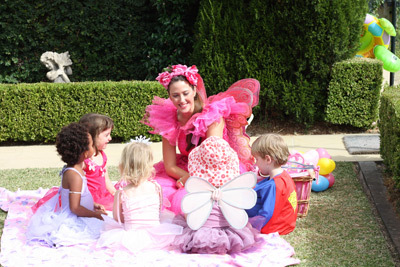 Fairy Entertainer: Wow what an amazing lady! 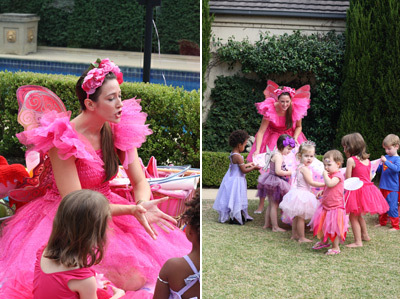 Our fairy entertainer was Fairy Star from Fairy Crystal and she was just fantastic. From the moment she arrived she was in character and had the children mesmerised. There was lots of music, dancing and games not to mention a special 'fairy crystal' gift for the birthday girl. Fairy Star was loved by all - the children and the parents (for entertaining the children while they had a much need caffeine hit). 1. Called the day before the party to confirm numbers including number of boys and girls to ensure they had the right number of girl and boy prizes/gifts for all children. 2. Emailed the day after the party to ensure we were happy with the service. 3. Sent a letter to the birthday girl after the party to say how much Fairy Star enjoyed the party - what a nice touch. 5. In my typical organised fashion - NOT!! - I called them two days before the party and as you can imagine they were booked solid however kindly fitted me and shuffled things around to make it happen. Excellent value for money! There are about six or so fairies to choose from. The owner of the business is a delight to deal with. Handmade: The cake (painstakingly so!) and the fruit and marshmellow skewers - love those. Tips: Bake the cake the day before - FIRST THING IN THE MORNING. Don't wait until the kids go to bed like I did! Something Special: Just seeing the kids together smiling and having fun AND of course my little girl - she is a delight as is her 19-month-old sister. 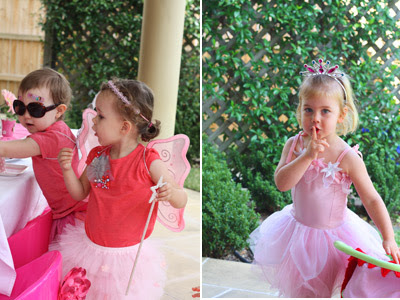 I think Nelle might wee in her tutu if a real fairy princess turned up at her party! Great post, lovely photos! Thank you sooooo much, you have just saved me having to find a fairy for a 6 yr old party in December! Will be stealing a few ideas too! You can never have too much pink. NIce job with the styling!